Brian Gross Fine Art is pleased to present A Figure of Our Times, a solo exhibition of work by the acclaimed Bay Area legend Roy De Forest (1930–2007), opening Thursday, September 6, with an opening reception on Saturday, September 8, from 4-6pm. The works in the show include selected paintings, drawings, and wall constructions. 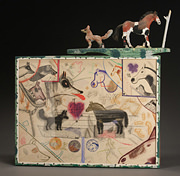 Roy De Forest was a long-time UC Davis professor, and a contemporary of artists such as Robert Arneson, Joan Brown, William T. Wiley and Peter Saul. Known for his vividly colored works imbued with myth and lyricism, Roy De Forest is considered one of the most original and influential artists of his generation. The work of Roy De Forest is highly personal and autobiographical yet set in a world of fantasy. Influenced by the stories of 19th century explorers, Roy De Forest took a storytelling approach in his work. Each composition is a brilliantly colored voyage into an imagined environment infused with dogs, horses, and human figures rendered in his trademark, brilliant color and thickly applied paint and mixed media. The work of Roy De Forest invites the viewer to engage in a humorous and whimsical dialogue about humanity. De Forest’s signature painting, A Figure of Our Times (1972) typifies the artist’s style seen through the use of elements such as tiny blobs of colorful paint applied directly from the paint tube to the canvas. Roy De Forest incorporates larger symbolic figures such as the figure of the dog and mythical creatures rendered with an immediacy and whimsical humor. The influence of Pop is clear through the incorporation of the dialogue bubbles found primarily in comic strips. Roy De Forest transforms the canvas into a stage in which his intricately imagined stories are played out. In addition, the exhibition includes smaller paintings as well as wall constructions and drawings. 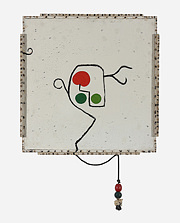 Featured in the show is an important early construction from 1960, Concerning White Elephants. 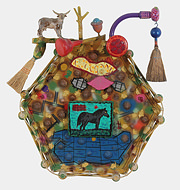 This abstract construction relates to his work produced in the 1950’s with the typical vivid patterning and combining of seemingly disparate elements like color, texture, wooden shapes, and assorted objects. 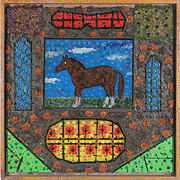 Also included is a rare drawing from 1977, Untitled (dogs and horses), in which horse and dog sculptures adorn the top edge of the frame, an element usually seen in his later work. Born in North Platte, Nebraska, in 1930, Roy De Forest received his MA from San Francisco State University, 1958, and taught at UC Davis from 1965 to 1982. 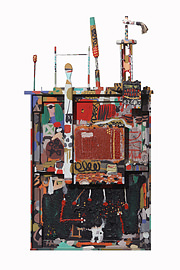 His work has been exhibited widely throughout the United States and Europe and is represented in numerous major public collections, including Centre Georges Pompidou, Paris; Denver Art Museum; the Iris & B. Gerald Cantor Center for Visual Arts, Stanford University; Museum of Fine Arts, Boston; Philadelphia Museum of Art; San Francisco Museum of Modern Art; San Jose Museum of Art; and the Whitney Museum of American Art, New York. 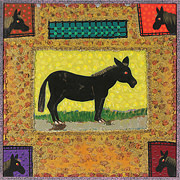 Roy De Forest was included in Renegade Humor at the San Jose Museum of Art earlier this year. 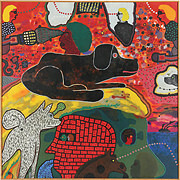 De Forest was the subject of a mid-career retrospective sponsored by the San Francisco Museum of Modern Art in 1974 that went to the Whitney Museum of American Art in 1975.